You don’t need to spend hundreds of dollars on passports for a tropical getaway with the kids. Consider one of these exotic no passport vacation destinations for your next family trip. Note: As of Feb. 5, 2018, some U.S. states require travelers to have a Real ID-compliant driver’s license or passport to travel anywhere — even domestically. Visit the Department of Homeland Security’s website to see how your state is affected. 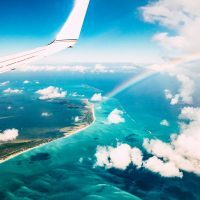 Yes, you can go to the Caribbean without a passport! In the U.S. Virgin Islands, you can go to three Caribbean destinations without a passport, in fact. On St. Croix, you'll find culture; on St. Thomas (a major cruise port), shopping; and on St. John, U.S. Virgin Islands National Park, which comprises most of the island. All three destinations feature fantastic beach resorts, though you'll find the highest concentration of them on St. Croix. Our suggestion? Stay on St. Croix and plan day trips to St. Thomas and St. John. All are easily accessible by ferry or a short plane ride. The Buccaneer is St. Croix's largest resort, with a wide variety of accommodations, onsite dining options, swimming pools, water sports, kids' activities and day trips to nearby Buck Island National Reef Monument. Another beautiful island in the Caribbean, Puerto Rico doesn't require U.S. citizens to bring passports. Vacation destinations in Puerto Rico include Fijardo, where you"ll find El Conquistador Resort and Las Casitas Village -- two Waldorf Astoria resorts in one. Both offer an all-inclusive package, too! Families can also vacation in or plan a day trip to San Juan to enjoy its history, beauty, culture and fantastic eats. If you have time, take a day trip to the beautiful island of Culebra, only accessible by boat. The perks of a stay at El Conquistador Resort include access to Coqui Water Park, located right onsite, and Palomino Island, a private island for guests of the resort. In the continental U.S., there's nothing more tropical than Hawaii. Plan a trip to Oahu to see the North Shore and Pearl Harbor, or plan to spend your time on the shores of Maui, traveling the Road to Hana while there. The kids will also get a kick out of Hawaii Volcanoes National Park, where they'll be able to see a real lava field. You can easily visit a few islands during one visit to Hawaii, though we wouldn't recommend more than two. A secluded resort on Oahu, Turtle Bay Resort offers luxurious accommodations, horseback riding on the beach, kids' activities and surf lessons on the North Shore. Key West is as close to the Caribbean as you can get without leaving the continental U.S.; in fact, you can actually visit the Southernmost Point in the U.S.! Your family will enjoy the history of Key West, which includes the Ernest Hemingway House, along with the colorful homes and delicious restaurants along and around Duval Street. 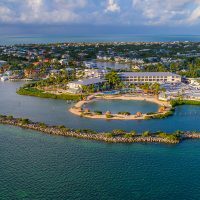 And while the beach isn't the main attraction (head to Islamorada or Marathon for that), full-service resorts beckon families to relax with private stretches of sand and surf, sparking pools, children's activities, onsite dining and more. This resort provides a little bit of everything - access to the beach, bike rentals, organized activities and a swimming pool. Best of all, it offers a quiet location at the end of Duval Street - close enough for convenience, yet far enough to avoid the nightlife noise. Unless you live in Hawaii, the American Samoa is a long trip -- it's about a five-hour flight from the islands. But it's a fantastic no passport vacation option for families who are up for the adventure. Popular activities include exploring the National Park of American Samoa and visiting the island's many beaches, such as Ofu Beach, famous for its coral reefs. There aren't any major resorts on the American Samoa, but Tradewinds Hotel is a nice home base for families. The beachfront hotel offers modern guestrooms and suites, a swimming pool, internet cafe and laundry facility.